If you get to the point in this downtrodden economy that you decide that the only way to find work is to make it yourself, you probably go for something you know. Maybe something no one else is doing. That made it a pretty clear choice for Dan Dominic to start a pedicab company. 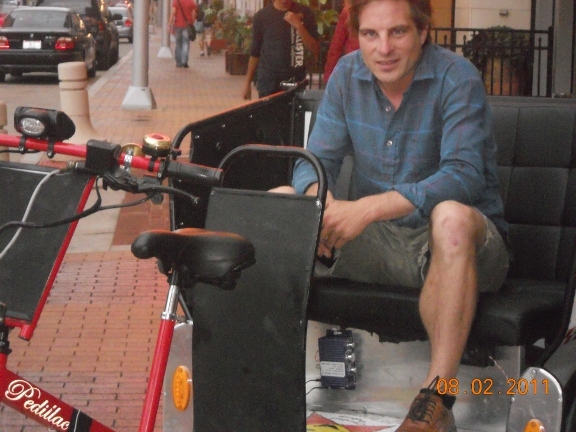 For six years, Dominic worked as a messenger downtown. He and his courier friends were spending their days pedaling around the heart of the city, delivering legal documents and Chinese food—those few business day essentials they haven’t yet figured out how to pass around electronically—to just about every building. And then at night they’d ride some more. They’d meet on Public Square. They’d explore the city’s dark corners. After 6 years of that, Dominic moved to Austin, Texas to try and start a life there. Might as well give it a shot, right? But it wasn’t long before he moved back to Cleveland. And not too much longer before he decided to put his history to future use by launching Ride On—a taxi service powered by his legs. He recruited some investors. He bought a pair of matching, heavy duty tricycles with a padded bench back seat for passengers. They’ve got head lights, tail lights turn blinkers, hydraulic disc brakes in back. They’re made by an Arizona company called Pedillac. People always ask him how much they cost. He hates that. It’s not enough just to have strong legs and a purpose-built ride, though. If you want to make a living pedaling people around the city, you’ve got to know the streets and the army of workers that look after them—the security guys, the police, the front desk clerks, the hotel concierges—in order to move around gracefully. You want to be on good terms. And on a Wednesday evening tour that covers East Fourth Street, Playhouse Square, and the Warehouse District, that proves true as people from all walks of life—police, bank security, custodians, and tourists all smile and wave, some calling by name. So far, he works for tips and doesn’t charge fares. He hasn’t been stiffed yet. His plan is to work it this way for a while to figure out what the going rate should be. It’s not like he could just use a traditional taxi-cab fare schedule. The businesses are completely different. 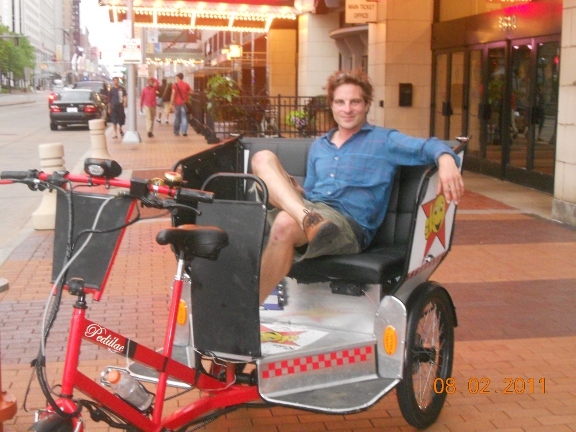 Ride On specializes in taking people on scenic routes that ultimately cover short distances: From dinner on East Fourth to drinks afterward in the Warehouse district, or from a show over on Playhouse Square to view the fountains after dark—before heading back to East Fourth for a drink. He works neighborhoods. Traditional taxi drivers aren’t interested in those short jaunts. They want to take you out to the Airport. But people out for a night on the town just want to see the sights or get to the next night spot. He typically gives 10 – 12 rides a night, with people tipping $10 and up. You can hire him to chauffer you around all day if you like. The cost would depend on your plans. 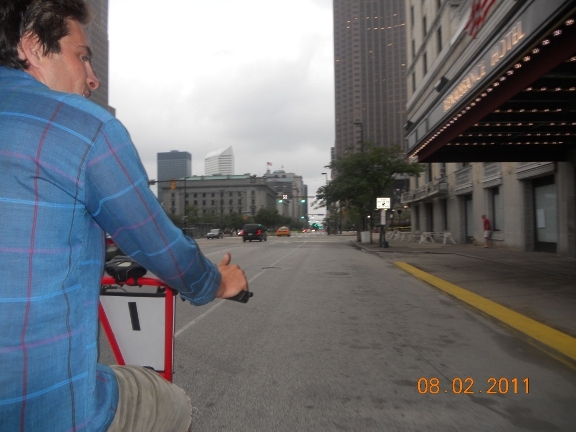 To get in touch with Ride On Cleveland, book your tour, or hire a pedicab for the day, call 216-214-8985, e-mail RideOnCleveland@gmail.com or go to facebook.com/RideOnCleveland.